Sawing Has Never Been Easier! 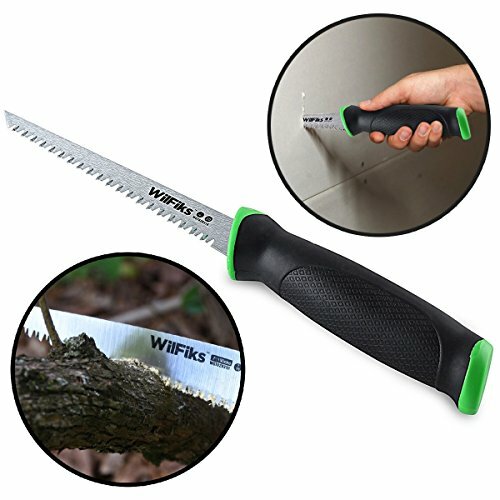 Whether you're a professional contractor, gardener or simply someone who enjoys sawing or gardening as a hobby, then you definitely need to add the WilFiks hand jab saw to your contracting or gardening equipment! With the WilFiks handsaw you'll be able to cut drywall, wallboard, pipes, flywoods, branches and twigs fast and effortlessly! Thanks to the long, sharp teeth and the 6.5 blades, sawing will become a breeze! Say Goodbye To The Blisters And Calluses On Your Palms And Fingers! Gardening is relaxing, but it is also tiring. That's why your gardening tools should be lightweight and ergonomically designed. Like the WilFiks hand saw! This handsaw has a soft, nonslip rubber handle that has been carefully designed to offer you the maximum comfort. Once you hold the handsaw in your hands you'll understand what we're talking about! That's why the professional hand saw is designed with extra secured blade to handle assembly. With this size saw, you will be able to carry the sharpened handsaw around with safety when you don't use it. That's convenient, isn't it? Time To Place An Order! Are you a farmer, gardener, general contractor, or woodworker? Do you need a good handsaw so that your job will become easier, faster and more pleasant? Then don't wait any longer! Get the WilFiks drywall/jab hand saw and start sawing like a true professional! The results will be amazing and you won't be out of breath! ► EASY TO USE: Our pro hand saw is designed for precise cutting including dovetails, miters, and tenons. The saw cuts through materials like wood, plastic pipe, plywood, wallboard and drywall. Ideal for your home and for framers, general contractors and woodworkers. ► DURABLE CONSTRUCTION: Induction-hardened teeth that stay sharp up to five times longer than standard teeth and produces smooth, sharp, and quick cuts. Extra secured blade to handle assembly for safety. The Saw has a sharpened tip that punches through drywall or other similar materials with ease. ► ERGONOMIC DESIGN: Anti-Slip Super Grip handle resists slipping and adds comfort, The handle size will work with any hand size from small to extra-large and is designed to help lessen fatigue when cutting. Unique handle design allows for superior cutting angle. ► QUICK CUTS: Three cutting surfaces to cut up to 50% faster than traditional handsaws. Pro hand saw fast cuts on push and pull strokes. Deep Gullets provide rapid removal of chips. ► THICK BODY BLADE: 6.5 inch Pro Jab Saw with a 7 TPI high carbon steel blade for rigidity and control. You can count on these Hand Saw to deliver superior, long lasting performance and great results. If you have any questions about this product by WilFiks, contact us by completing and submitting the form below. If you are looking for a specif part number, please include it with your message. MERIT PRO 00705 Stamped Tooth Jab Saw, 6"